MIM Variocage Double Dog Car Crate - the SAFEST and the ONLY Crash Tested Dog Travel Kennel, and the Best Minivan, Vans, Truck, and Station Wagon, and SUV Dog Crates. The MIM Safe Double Variocage is HANDS DOWN, the safest and highest quality engineered crate available in the world. Why? 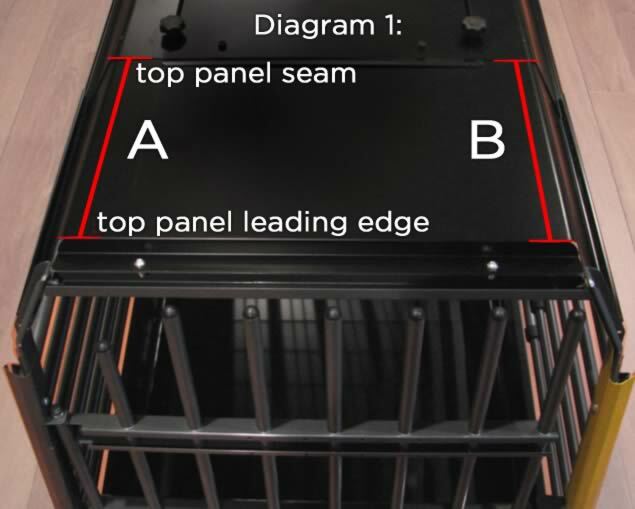 Because it is the ONLY double dog car cage in the world that is crash tested certified and approved for front, rear, and roll over impacts in a way that protects BOTH humans and dogs alike in the car. Each model has gone through rigorous testing and has been proven to withstand all different types of collision (based on stringent UNECE standards). This dog car kennel was designed to save lives, and has proven that it can many times over. A large dog cage, great for one or two large dogs, or more smaller dogs. When using it with two dogs of different sizes, the center divider can be adjusted to provide one with additional space. The divider is also easily removed to accommodate one extra large breed dog, or several smaller dogs together. For a Limited Time, Pet Pro Supply Company is proud to offer Bundle & Save Accessory bundles for this Double Dog Variocage! Simply select the bundle you want before clicking ADD TO CART. Due to special promotional pricing, this Bundle & Save Accessory package costs LESS than the price of the Variocage Double on its own! We are also offering several other heavily discounted bundles with even more accessories. Click here to see the additional Variocage Double Big Accessory Bundles. Adjustable for ANY Dog Breed - There are four Variocages of various sizes, each of which is adjustable, making these travel crates flexible enough to accommodate ANY size dog breed. The back section of the center divider can be removed completely or adjusted to lock diagonally and give a larger dog more room. We are so confident in the Variocage Double, that we offer a Free Replacement Variocage Double - after a Properly Documented Accident! After an accident, your dog may be injured, frightened, or both. This potentially poses a threat to to emergency res ponders and can prevent them from helping any injured occupants who may be in need of immediate assistance. In the absolute worst case scenarios, an aggressive dog protecting their owner at the scene of an accident may need to be sedated or put down in order to get to an injured person. Yes, the MIM Variocage has an adjustable length. The only thing is, depending on the space you have around the Variocage, it could be difficult to maneuver around to all of the knobs and rubber stoppers, but hopefully this give you an idea.